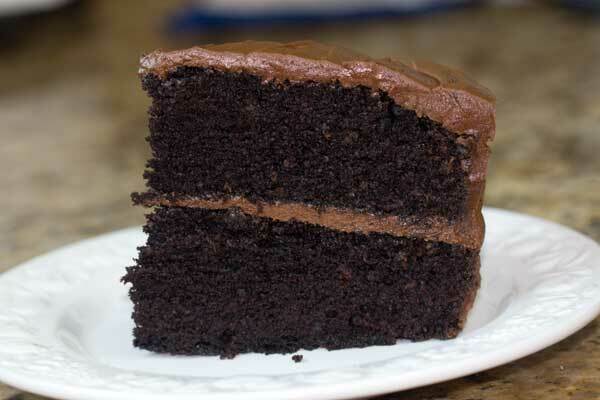 In case you missed the news, yesterday was not only National Baking Day, but National Devil’s Food Cake Day. And while I admit to not taking full advantage of the excuse to make a devil’s food cake, I made another type of chocolate cake which was just as good — a chocolate mayonnaise cake. If you’ve been following this blog for a while, you know I like mayonnaise cakes! This, however, was a new one. The recipe is adapted from Serious Eats, and while I’m sure it is outstanding made as written, I had to play with it a bit. — Because I like the flavor of brown sugar in chocolate cake, I substituted a little brown sugar for some of the granulated white sugar. — I also changed the method a little by mixing the cocoa powder with the boiling water before mixing, because I’ve read that doing so helps release the flavor of the chocolate. — To make the cake a little more interesting, I added a teaspoon of espresso powder. Why not? I had some. — For the cocoa powder I used Hershey’s Dark, which is Dutch processed and therefore more alkaline. While natural cocoa powder might work just fine, I’m guessing the alkalinity of the Dutch process cocoa reacts with the acid from the mayonnaise and the baking powder and helps this cake rise. — And finally, for the frosting I used Scharffen Berger natural just to contrast with the flavor of the dark cocoa powder. All in all, it was an exceptional cake and will definitely go in the make-again file. A rich, not-too-sweet chocolate cake made with Dutch process cocoa powder and mayonnaise. Preheat oven to 350 degrees F. Spray two 9x2 inch round metal baking pans with flour-added baking spray (Baker's Joy) and line the bottom with circles of parchment (just to be safe!). In a large saucepan, boil the water. Remove from heat and add the espresso powder and cocoa powder. Stir until smooth and set aside. In the bowl of a stand mixer, beat the eggs, sugar and brown sugar for a full 7 minutes or until thick and light. Add the mayonnaise and vanilla and beat on medium until combined. In a second bowl, thoroughly mix together the flour, baking powder, baking soda, cocoa powder and salt.. Add to the egg mixture and stir until mixed. Pour in the cocoa mixture and stir well. Batter will be thin. Pour into prepared pans and bake on center rack for 30 minutes. Remove from oven and let cool on a wire rack for 10 minutes. Invert cakes on a cooling rack, peel away the parchment (if you used it), and let cool completely. To make the sour cream frosting, beat the butter and cocoa powder in a large mixing bowl until mixed. Gradually add the confectioners’ sugar (and salt, if using) and sour cream and beat until smooth. Beat in the vanilla. I’ve made this cake a few times now and it’s definitely a favorite. It’s moist with great chocolate flavor, great texture, and excellent frosting. 2 cups sugar, 2 cups flour, 2 cups brewed coffee, 1 cup cocoa, 1 cup mayonnaise, 2 teaspoons baking soda, 2 eggs. Blend well, grease 9×13 pan. Bake at 350 degrees for 40-45 min. I halved it. First time used cold coffee, 2nd time warm water, no coffee. Much better with the coffee but VERY edible with the water. I used Hershey’s special dark cocoa. Both times I used a glass baking pan, baked at 350 for 35-37 min. Cake is almost like fudge. What surprised me is… I have never liked the taste of coffee. I COULD not tell in this cake. Wow! Just expanded my horizons. Thanks, Anna! That’s very helpful. It’s true, I think the density of cocoa powders can vary depending on how settled or packed it is, etc. Hi Julie! Good question about the cocoa powder. I never weigh it, but the general weight for Hershey’s Dark cocoa is 1 ounce/28 grams per 1/3 cup. So for this I used about 68 grams. I think you are right about weighing cocoa powder — especially if you are trying a new brand. I bought some very expensive cocoa powder and noticed my brownies and other baked goods were a bit dryer than usual. I blamed it on the cocoa powder itself, but now I’m wondering if it was just a little heavier cup for cup and if I should have just used less. I also like mayo cake. There is a little mayo cake on your blog that we liked a lot and was a nice size for a smaller household. I can’t remember the name of it. Maybe Troy Chocolate cake? I love homemade chocolate cakes, especially ones that have either mayo or buttermilk. It looks absolutely delicious. It appears to be wonderfully moist and have a perfect density (dense enough so that it has that homemade quality but not too dense). My father would also adore this. Oh, fond memories. My mother made a wonderful mayonnaise cake. I’ve made it too from her recipe. My fav!